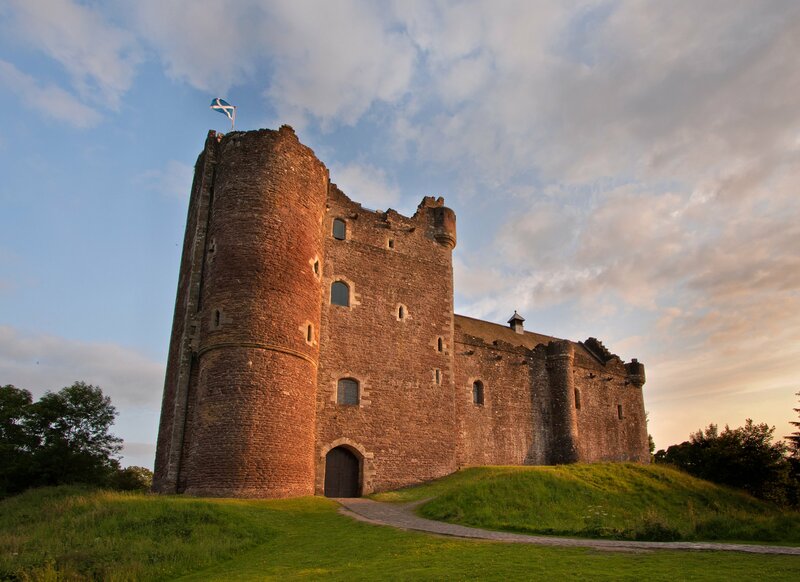 More than any other castle you can visit in Scotland, a trip to Doune shows you what a medieval castle was really like. Although the original building was probably started during the 13th century, none of that remains. What you see today is the castle as it was rebuilt by Robert Stewart, Duke of Albany, in the late 14th century, with very few alterations to its layout.Although it’s been a ruin since the 18th century, the castle remains largely intact, its structure obvious. Standing on a picturesque site above the River Teith, Doune Castle was built around a central courtyard. You enter through a gatehouse almost 100 feet (30 m) tall, and above the entrance, the Lord’s Hall has been restored with timber panelling and a minstrels’ gallery. Higher up are apartments used by the duchess, a Great Hall and very extensive kitchens below. The living quarters and other buildings occupy the north side of the courtyard. Because of its appearance Doune Castle has been used several times as a film set. It has featured twice in films based on Scott’s ‘Ivanhoe’ and more recently has been used as a location in the TV series ‘Game of Thrones’ and Outlander. However, by far its most famous screen appearance was in ‘Monty Python and the Holy Grail’ (1974) – in which it featured as Camelot. Visitors can hear clips from the film and listen to an audio guide narrated by Python star Terry Jones.